In June 1991, I went to Symi with my husband for a two week holiday through a tour operator. The villa we had booked was overlooking the harbour and had, according to their brochure, 'spectacular views'. As we arrived late at night, after a long journey from the UK, we were obviously unable to see if this was true. I therefore couldn't wail until the following morning, so as to see it properly. No brochure description, however, had prepared me for what I was about to see and experience the following morning after opening the shutters. I was literally stunned by the view! Not only was it breathtaking, I felt as if I had stepped into another world entirely; I could not have asked for a better and more rewarding first visual contact with Symi in the daylight. Added to that, the villa itself was a beautiful old house and authentically rustic. The whole holiday could therefore not help ending up being truly unforgettable and I remember upon leaving on the ferry, as the wonderful harbor gradually disappeared in the background, I made myself a promise that we would have to return 'soon'. Life has a way of turning out different to one's plans, however, and even though we talked about it several times, one thing or another dictated that it would be eleven years before we set foot on Symi soil again. It was during 2002 that we put plans in motion to leave the UK and move to a Greek island. We were considering several, but funnily enough Symi was not one of them: as we thought it might be too small and too inaccessible in the winter. Rhodes, however, was one of our choices and so when we came over to undertake some 'research', Symi was too close not to at least take a day-trip over for 'old time's sake'. The rest though is, as they say, history. We ended up staying a week and during that time, we had made friends with the couple that we would eventually start the Symi dream website with, amazingly re-acquainted ourselves with islanders and ex-pats who had been on the island back in '91 (and remembered us) and rented a house from January the following year; which gave us three months to go back to the UK and actualize our plans. Thankfully when we were on the island, we had been looking at it not through rose-tinted glasses, but with the stark reality as to what it would actually be like to live on such a small island out of tourist season. This held us in good stead, as after we moved here, the island experienced its worst winter for thirty years, but thankfully this did not diminish our enthusiasm. Fate still had one card up its sleeve, however, and that was during the first summer I was offered work as a rep by the very same tour operator we had traveled with all those years ago. I therefore ended up looking after guests staying in the exact villa we had stayed in all those years before. Now that I have been here for nearly two years, I can say that for me living in Symi is a very valuable experience; productive but challenging at times, easy going yet exhilarating at others. As for visitors to the island, they are always stunned by the natural beauty and architecture of the place, as well as the welcome they receive from the locals. Most café and Taverna owners will remember you even if you have only visited the island once and it was a number of years before. 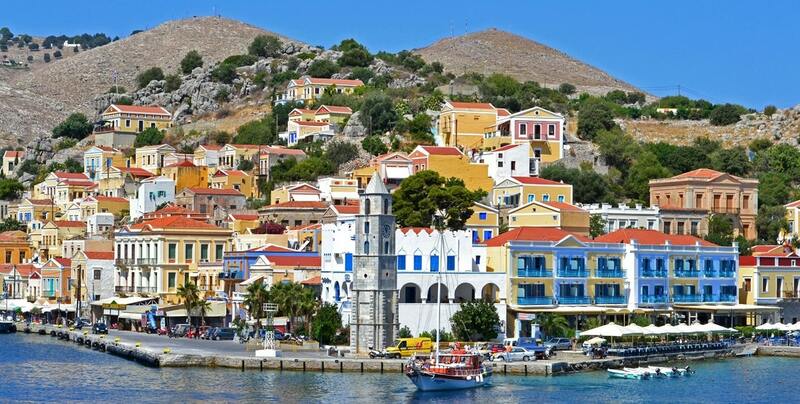 You can find more details by visiting Matt's webpage for Symi.